“Today’s trends are important for hoteliers to be on the cutting edge of providing the perfect services, especially in creating food menus that please the palates of travellers regionally, from local to international visitors alike,” Nusrat Parveen, Managing Director of Unilever Food Solutions Malaysia. Unilever Food Solutions’ Ambassador Chef Richmond Lim and its South East Asia’s Regional Executive Chef Dhillon Ng presented the insights on the MICE (Meetings Incentives Conventions & Exhibitions) trends and updates, five upcoming food trends with a delicious showcase of food stations based on these trends in a memorable food tasting experience. 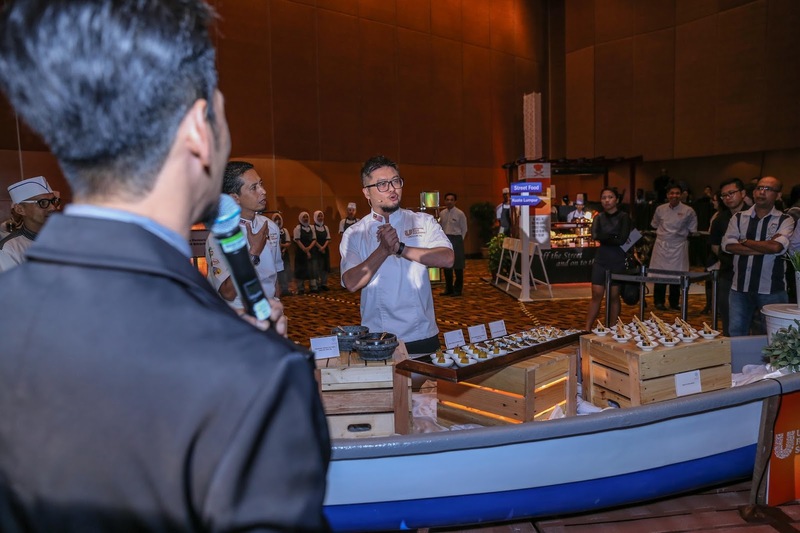 The exclusive event’s theme was based the book “Buffets Around The World : Trendwatch Hotel 2016” published by Unilever Food Solutions with information from diners and food experts alike. Unilever Food Solutions combined their industry experience with reports by professional market researchers such as Mintel and Nielsen, interviewing tens of thousands of people to gather data. “As a result of today’s “culinary revolution” food is often the centre-piece of an event. Creating a memorable culinary experience now has to go beyond just tastes and flavours, it has to provide a sensory experience that satisfies all 5 senses to make an impactful impression. As such, chefs must place greater emphasis on finding innovative ways, through flexible set-ups and unique crockery, to develop “eye catching” creations to link the decor, ambience and deliciousness of the food being served,” said Chef Richmond Lim, Unilever Food Solutions’ Ambassador. Award-winning author Chef Richmond Lim brings over 32 years of banqueting experience in 5-star hotels and convention centres, specializing in today’s modern cuisine. As the Executive Chef of the Kuala Lumpur Convention Centre, he is responsible for overseeing a culinary brigade of 51 chefs, setting new standards to the Centre’s dining experience to new levels. Chef Dhillon Ng has diverse experiences from across the region, bringing a track record of years of expertise, having worked with some of the best chefs in the region: Jeremy Hollingsworth, the former Head Chef od Qua Vadis, a one Michelin star restaurant in London; Jimmy Chok, Singapore’s master of Fusion Cuisine; award-winning Robin Ho, Executive Chef of Marmalade Group and many more. Malaysia is indeed Truly Asia because the nation is a melting pot of various Asian cultures reflecting a vast variety of food showcased throughout the different states in the country. Malaysians are constantly celebrating with food in terms of everyday meals and special occasions with office workers, families and loved ones, often tweeting and uploading photos on social media platforms like Facebook and Instagram. As a thought leader in culinary experiences trending in the fast growing world of the travel and hospitality industry, Unilever Food Solutions works successfully with chefs in hotels and restaurants from over seventy countries to make their business relevant in current times. Our ingredients are some of the staples of professional kitchens in 74 countries around the world : Knorr, Lady’s Choice, Lipton, Planta and more. We’ve been in food since the 1880’s. We’re chefs ourselves. Unilever Food Solutions (UFS) is the food service division of Unilever. It is the only food manufacturing company to employ over 500 chefs globally, including Malaysia, playing critical roles across different functions. As one of the world’s top food service companies, UFS provides professional ingredients and services to meet the many different needs of our customers – from hawker centres to 5-star hotels; and from school canteens to large food chains. We help chefs all over the world to serve tasty, wholesome meals that keep guests coming back for more. In Malaysia as in elsewhere, we create ingredients that save precious prep time in the kitchen, without compromising on flavour or flair. And we’re constantly providing ideas and inspiration, not just to keep menus fresh and exciting but to help customers get that critical balance right between impressing guests and making a profit.